Me: What, you can double kill dead people? Me: Ummm..this is true. But I haven’t had any practice. Have you? Her: yes, and while there is variation in what it takes, it is generally a disruption of the brain signal. you have to get them in the head. I mean, I haven’t had practice braining zombies. But I pay attention to what I would need to know should it come to that. Me: I believe one of the fundamental definitions of being dead is having no brain signal. (Here my husband, who is evidently conversant in zombie lore, AND eavesdropping, informs me that there is reactivation of the brain. Her: well, the reanimation of a corpse and relevant motor skills would tend to make me think there is some brain function going on. Me: So they aren’t the undead. They’re the sort of but not quite dead. Her: Depends on the lore. But yeah. Her: You’re the one taking archery lessons. That seems the most likely scenario for it to come in handy. Her: Either that or if you accidentally travel 200 years back in time. Me: There’s always shooting seagulls. Her: I thought that was an urban legend. Although I suppose that could sound very naughty to an 18th century ear. Me: it was the 16th century. Her: And that (seagull murder) crushed me. I don’t want you to live with the burden I bear from that tragic and terrible death. Me: I think I could live with it. They bear no resemblance to Bambi. Besides, once they steal your spicy Thai seafood wrap there is no mercy. All this talk about zombies made me think of the French teacher. An interesting segue, I know. 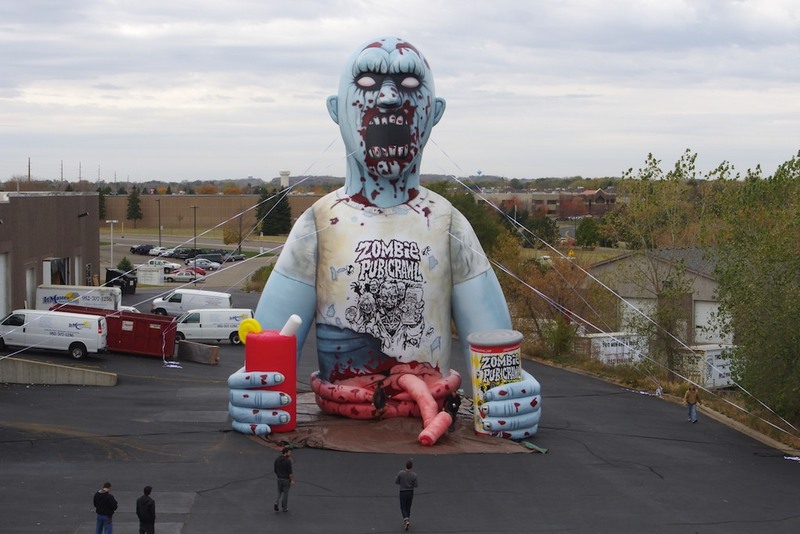 Me: Checked into inflatable zombies. I’m always thinking of you. Me: I make time for the unimportant things in life. Me: I found one about 40 ft tall but it would take up half the parking lot. Frenchie: Administrators would be pissed. They don’t have a sense of humor. Me: Be interesting to fill it with helium and tie it to your car. I quickly tire of the French teacher and return to my kid. Me: I’ll try and get a zombie blow up doll for your visit next week. It will be waiting for you on a seat in the bathroom around 2 a.m. Drink lots of beer. Her: Well, that is an incentive to visit like nothing I’ve ever heard. Me: I can do house calls too. Why is there a pig in your classroom?